DIY Archives - Medical Marketing Enterprises, L.L.C. May 12, 2012 by Randall Wong, M.D. Your website should contain 3 basic pages; Home, About and Contact. When starting to build a website you should still create these pages first. Your home page has one purpose. It must quickly convey the type of medical services you provide. If your home page is too busy and distracting…you can’t deliver your message. Your readers will click away. Just like the front door of your home, the home page conveys an image and message about your practice. Whether you convey this information through a nice header, bold title or nifty tagline, your readers must be able to know they have found the right type of website. If you have yet to start a website, use the URL to also provide this information. The about page should be the first page added to your new website. While the home page conveys what you do, the about page should convey who you are. It’s a great way to show some personal transparency. It is here that you get to tell your story. All too often, the “about” page is mistakenly used as an online resume or curriculum vitae. While it is important to convey your credentials, take the opportunity to talk at least a little bit about your hobbies, practice style, etc. Most readers have no idea about the rudiments of medical training and reading the highlights of your medical career tends to mimic every other medical professional; great credential after great credential becomes meaningless to our future patients because there is no relevance. Use the About Page to distinguish yourself from your colleagues and competitions. Be bold and tell a little of the human side of you! Be transparent! The contact page should list all of your contact information. It doesn’t have to be fancy, but list all the different ways a patient can find you. Most of the elements are self-explanatory, yet I’d stress that you should list the real name/email address of a real person to contact. “Contact” or “Support” are not as good as giving the first name of a true person in your office. Take the opportunity to make every item as personal as possible….it matters. December 7, 2011 by Randall Wong, M.D. After your have purchased your URL, hosting and installed WordPress.org, your next tasks are to start a GMail account, install Google analytics and register your site on WebMaster Tools. All these are Google products, are free and require a Google/Gmail account. Go to Gmail.com. There will be a link to create your new Google Account. It is free. “Create an Account” and follow the directions. This will now give you a username and password for all of your Google products, e.g. 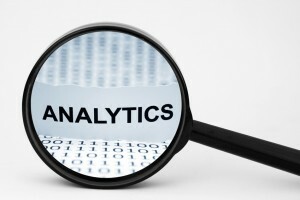 Google Analytics and Webmasters Tools. Installing an analytics package onto your website is one of the first things you need to do with your new site. In short, analytics allows you to find out about your readers: what they like to read. Remember, your goal is to rank your website high to get new patients. Valuable, highly ranked sites get there by providing information relevant to the users’ (patients’) search query. For instance, I found that many of my followers like information on retinal detachments. I noticed this by reviewing my Google Analytics data. 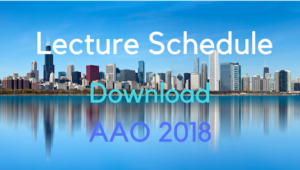 Articles on retinal detachments are read more often than any other topic on my site. Thus, I know that I’ll attract more readers if I continue to write on retinal detachments. Google also offers this free tool. Webmasters tools can do many things (see below), but this is the best way to submit your site to Google. If your site is new, you want to tell Google that you have a new site so you will be indexed. Google can not rank your site if it does not know you exist. If you have an older site, it is may already be indexed. Perhaps the most important function second to allowing Google to index your site is to verify that you have a sitemap on your webpage and that it works. A sitemap is basically a file on your site that functions as a table of contents for the search engine bots. Search engines look for a sitemap, without a sitemap your pages may not get indexed. Without indexing, you may not rank. It’s important for your SEO rankings. November 13, 2011 by Randall Wong, M.D. When you choose “hosting” for your medical website, use the same company from whom you bought the URL. Try to keep things simple for yourself, no need to add another variable such as an additional vendor. Usually you can buy both the URL and hosting at the same time. There are a variety of hosting choices available for you. All you need is “shared hosting.” You need to choose a plan that is; affordable, reliable uptime, 24/7 customer support and can run WordPress.org. 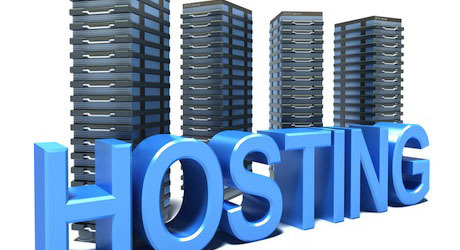 These are basic requirements and are provided by most hosting companies. All other “higher” forms of hosting really differ with respect to handling traffic, security and bandwidth. They function and are indexed as well as any other, but there are limitations to design, functionality and SEO. It may be a good place to get your feet wet, but if you want to do this right, and still very cheaply, then start off with the recommendations below. Instead of setting up an account on a 3rd party’s server, you have free space on the respective servers here. Simply go to these sites and sign-up. Instead of the completely free sites, we recommend using anyone of the companies listed below and looking for shared hosting plans. Shared hosting is the most popular and affordable form of hosting other than free. 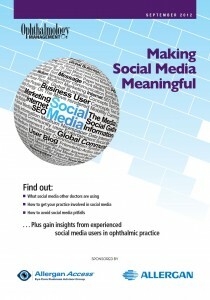 For a small business, such as medical practice, this is all you will probably ever need. It offers complete flexibility as your website grows, can accommodate more visitors than you ever hope, and has virtually no requirements for learning how to maintain your site from the IT perspective. With your shared hosting plans, the many websites are using the same server and the resources are “shared.” At times, this may slow the download speed of your site. Purchase an account (through our affiliate link please!) and host your site with one of the following companies. For our purposes, both virtual and dedicated hosting are options that you may consider if your traffic exceeds what normal shared hosting can provide. Unless you have thousands of visitors a day occupying your bandwidth with large file transfers (both unlikely with a medical website) you probably do not need either of these levels. Also, with virtual and dedicated hosting, you will mostly likely need to be responsible for maintaining your server. Increased cost and increased IT responsibility. Remember, we are doctors. These are the new wave and, for now, might be a better consideration if you mature beyond the needs of shared hosting. Cloud servers offer the advantage of reliable uptime as multiple “copies” of your site are always available and, thus, your site is not affected natural disasters, equipment malfunctions, etc. This situation also requires you to provide your own IT support. With more and more offices equipped with your own servers, this may be a viable option for you. Of course, you must provide your own IT support. June 10, 2011 by Randall Wong, M.D. 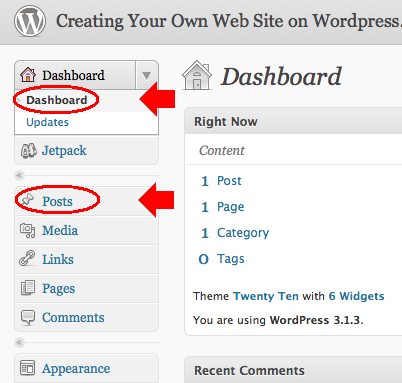 Writing your first post in WordPress is pretty easy. This post will walk you through the steps and screens that you need to start your very first post!! 1. After logging in to the administration panel of your web site. 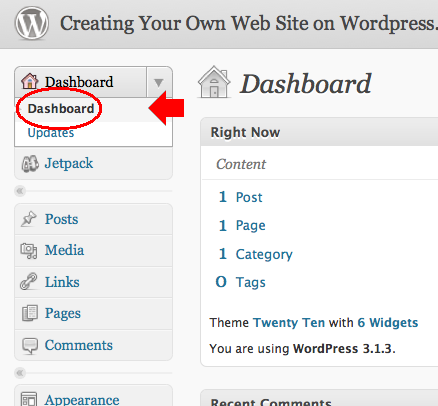 You should see the following screen, if not, click on the Dashboard link as highlighted. It is also located in the left column of your screen. When comfortable….click on “Posts” and the link should expand. Your page should now look like the screenshot below. 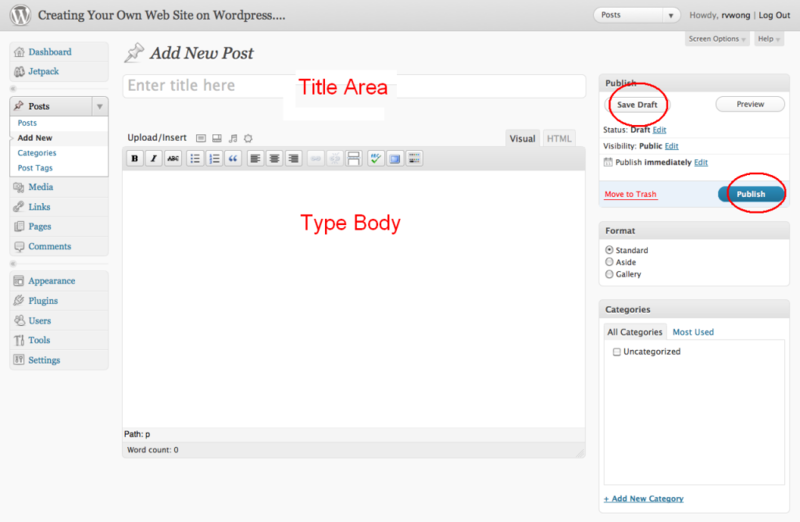 Click on the appropriate areas to add your title and content of your article. It is as simple as using any word processor. If you want to save your work without publishing it, click “Save Draft.” “Publish” will put your new post on the Internet! 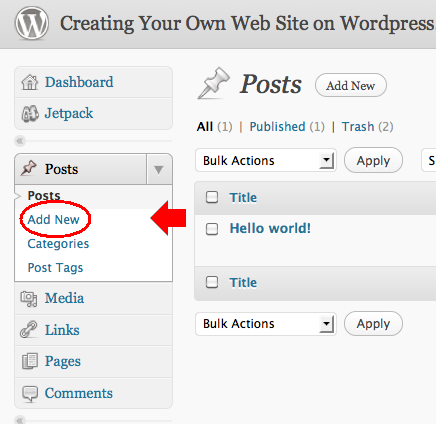 Remember, you can always edit or remove posts and pages on WordPress at a later time!! May 8, 2011 by Randall Wong, M.D. Using anchor text is the best method to create a hyperlink. It describes the link and maximizes the SEO of either inbound or outbound links. It is a valuable to understand especially if you are creating or managing your own website. 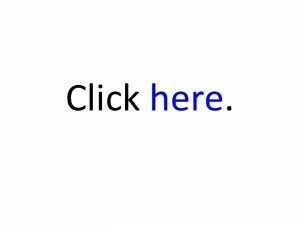 A link, or hyperlink, allows the reader to “click” and initiate an action. Usually a hyperlink can take you to another web page, web site, downloadable document, etc. Images can also serve as a link. A hyperlink, or link, is often highlighted or colored and maybe underlined. It is created automatically using your web page/blog software. There are several ways to set up a hyperlink. The most common, and basic, structure is to simply highlight the entire URL (URL = “www.typeyourwebsitehere.com”) as the actual link. This works and is fine, but it is ugly and has almost no SEO value. Clicking on this link will take you to your desired page. This is probably the most common hyperlink using anchor text. By clicking on “here,” you are taken to your destination. Looks better because it is readable text, but little SEO value. Technically, “here” is describing your target URL. Just as you would create a link using the word “here” and link it to your URL, this style of linking allows you to use keywords to describe the content of the target. This is the value of using keywords to describe target URL’s. The words, or phrase, you use as the actual text to construct the link let’s Google rank our page higher with this added information. Anchor text, as back links, from an external source, when contained in rich, relevant content are the best endorsements of your web page and will garner the highest rankings. My web site on retinal disease. We teach you how to improve your medical web site rankings. External Links: These are links away from your site. I prefer to use anchor text almost exclusively because it looks and reads smoother. 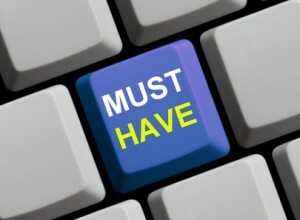 Links away from your site have the least SEO value. Internal Links: If you notice, almost every article we produce as at least 3 hyperlinks per article. Most times, we prefer to link to pages or posts internal to this site. This internal linking as SEO value, so we try to use anchor text as much as possible. Images: This is probably overlooked by most designers and SEO specialists. Choose an image to serve as the link and then choose your target URL. NOTE: place keywords, text in the “alt text” window of the image to maximize the SEO.